Recently I’ve written about the inverse of P/E ratio (which I call corporate earnings yield) vs. risk-free return (government bond yields). As inflation expectations drop, interest rates also drop, and valuations adjust higher as investors expect less return on their investments. It’s a simple relationship (more below), and it shows that US stocks are fairly valued. But just because you can buy the S&P 500 for a fair price doesn’t mean you should stop looking at other stock markets around the world. We just can’t focus too much on price/earnings. We need to include the prevailing interest rate in each country. 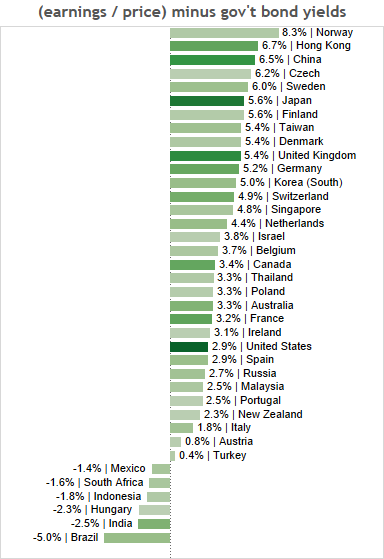 For example, by price/earnings alone, Brazil looks exceptionally cheap. But investors are rightly demanding higher yields to compensate for runaway inflation / risk of devaluation. Below is a calculation of P/E ratio by country from StarCaptial, but with a twist. 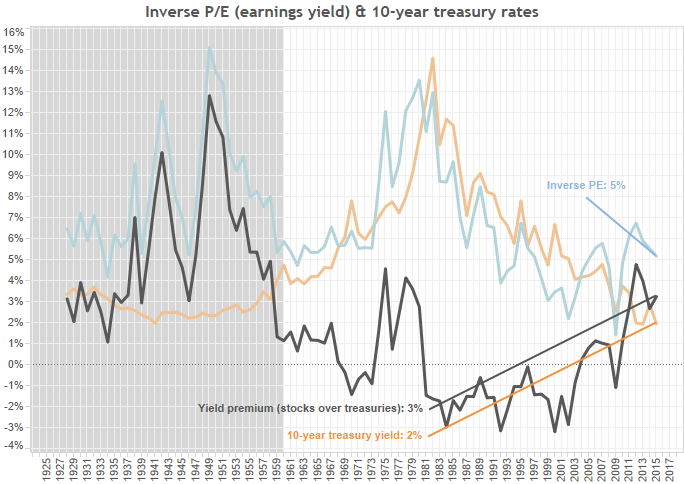 I’ve taken the inverse of P/E (which is corporate earnings yield) and subtracted government bond yields. Thus we get an adjusted premium of corporate earnings over inflation. The more green, the larger the market (and hence the higher liquidity). While Norway and the Czech Republic are flashing “buy”, I would prefer markets with more liquidity. They are more likely to adjust to a “normal” valuation. Which markets stick out? China, Japan, the United Kingdom and Germany all have more liquid markets and a healthy corporate earnings premium over government bond yields. Companies are earning well compared to their market caps, and with little inflation to boot. I expect valuations in these countries to adjust upwards in order to bring the corporate yield premium back into line. If you don’t believe me, take a look at the graph below for the S&P 500 vs. US 10-year treasury rates. Before 1960 we had lots of volatility in economic growth (1920’s boom, Great Depression, World War II, post-war depression, Korean War inflation, etc.). Since then earnings/price has roughly followed 10-year treasury yields. In fact, earnings over price is a decent amount higher than treasuries at the moment, signalling that the S&P 500 is a buy (despite high P/E ratios). What’s going on? Stocks are adjusting to expected long-term interest rates inflation expectations. Because of this, stocks are fairly valued. Below is the relationship. As 10-year treasuries yield less, the inverse of PE/CAPE goes down. 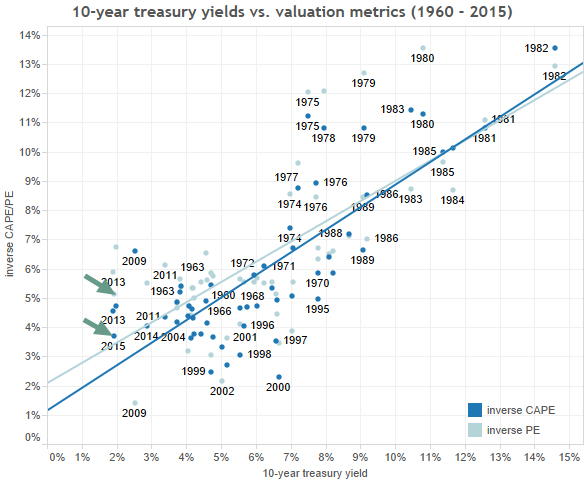 Lower interest rates = higher valuations. In fact, by the regression lines below, stocks would have to move higher in order to meet the model. Either that or interest rates will have to jump. While rates will probably move up somewhat, it’s hard to see a big jump since inflation expectations remain muted (for those of you about to blame the Fed for loose money, remember that low rates are a symptom of tight money / low inflation expectations). Because CAPE was still somewhat high in 2009, investors would have missed the last few years of tremendous returns because they failed to adjust for long-term inflation expectations. In fact, I believe US investors could be waiting for a long time for the next big stock market crash. That said, US markets have been on a tear the last few years. But don’t fret. All the stock market ships didn’t set sail in 2009. But they are pulling up their anchors now. If you’re into ETF’s, China (FXI), the United Kingdom (EWU), Germany (EWG) and Japan (EWJ) should bring you pretty good returns over the next few years based on my first graph. If you’re like me and you want to find value within value, in the markets above I’m long HSBC (HSBC), Toyota (TM) — see car industry analysis I did in January, GlaxoSmithKline (GSK) and Bank of China (BACHY) — see bank analysis I did in February. I also have call options on Deutsche Bank (DB). All the stocks have the benefit of being undervalued individually within an undervalued market. Happy hunting.